I was always searching for Lincoln! As an adult, one of my best friends challenged the idea of ‘HEAD’S UP’. He felt that all change was good luck, whether it was UP or DOWN. It didn’t take me long to process that thought……he was right…..money is money……change is change. Well, this week has been quite a week in Real Estate. We’re processing a couple of short sales, helping a Veteran to purchase his first home, setting up marketing for new listings, working with a few tenants to find new places to rent, learning how to utilize excel spreadsheets to keep up with some of our communications, watching students pass their exams at Real Estate school, among other things. And let me tell you………the pennies are abundant……..loose change is plentiful: at the park, in closets, in the washing machine………..it’s been amazing. 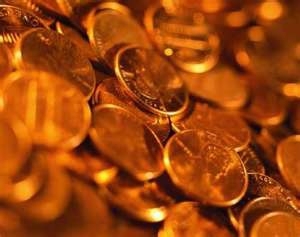 I see every coin as a positive sign of good things to come. So, my advice to all my Realtor friends is, “Don’t forget to look down as you’re going about your day.” You just might see plenty of signs of the abundant days that are to come! Both HEAD’S UP AND HEAD’S DOWN! Previous Post Ready – Set – GO!! !